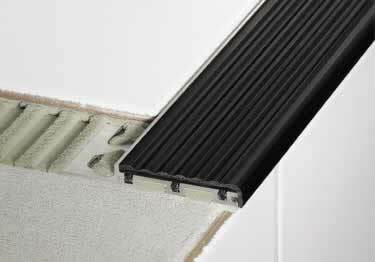 Schluter® TREP-SE, TREP-S and TREP-B stair nosing provides an easily visible, slip resistant stair nosing that improves safety while protecting tile stair edges, even in heavy foot traffic. These durable stair profiles are constructed from stainless steel or aluminum and are great for use in offices or public buildings. All models feature a trapezoid anchoring leg which is secured in the mortar bond coat beneath the tile and supports the slip-resistant thermoplastic rubber wear surface. The TREP-SE has a stainless steel support with a 1-1/32" thermoplastic rubber insert. The TREP-S also has a 1-1/32" thermoplastic insert but has an aluminum support. The TREP-B has an aluminum support with a 2-1/6" thermoplastic insert. Inserts for all models are available in yellow, grey, light beige, nut brown, and black to meet your design needs. Profile Heights: 5/16", 3/8", 1/2", 9/16", 1"
Heights: : 5/16", 3/8", 1/2", 9/16", 1"
TREP-B Heights: 5/16", 3/8", 1/2", 9/16", 1"
Schluter® TREP-SE, TREP-S and TREP-B stair nosing provides an easily visible, slip resistant stair nosing that improves safety while protecting tile stair edges, even in heavy foot traffic. These durable stair profiles are constructed from stainless steel or aluminum and are great for use in offices or public buildings. What I expected and the quality is good. Would recommend for 1/4" tile stair nosing. Profiles, corners, and connectors. Available in a variety of sizes in brushed stainless steel and anodized aluminum.